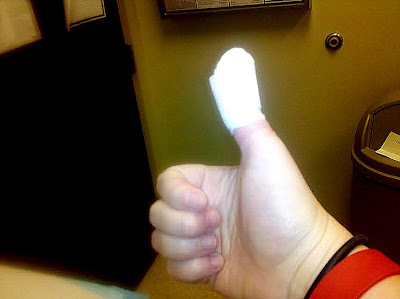 In another beautiful feat of Swim Bike Klutz, I managed to wedge a sliver of laminate flooring under my thumbnail. I was cleaning up after the kids, of course. Wiping the wood floor, and smash – wood under the nail. Eeeeeeeek! So yesterday, I had this sliver of pain removed by the doctor, complete with shot and minor surgery of what I believed to be the removal of the vast majority of my thumbnail. I didn’t watch the procedure. I could only imagine the horror. I went to work afterwards, moping, with my thumb all wrapped up and thinking, How can I ride my bike in this condition! This morning, I unwrap the bandage and brace myself for the general ickiness. Well. It appears that I am not only a huge klutz, but also a massive sissy. Only about five millimeters of thumbnail is gone. The Expert looked at it, and gave me a snicker that was so painful, I was actually shamed by my sissiness. Wow, I am so lame. So I took my thumbs up outside and ran a hard four miles. And then I felt better. We all have our klutzy moments… its's ok… trust me! Hope you thumb heals soon!